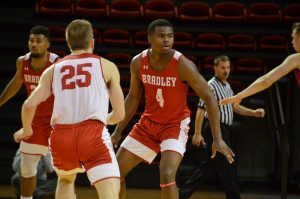 ST. LOUIS – Bradley’s Sam Maniscalco scored 31 points to lead the Braves to an 81-62 victory over the Creighton Bluejays in the quarterfinals of the Missouri Valley Conference tournament in St. Louis Friday afternoon. The junior guard became the first player since Creighton’s Nate Funk in 2007 to score 30 or more points in a MVC tournament game. The Bluejays began the game on a 9-0 run and lead by as many as nine points twice in the first half. Bradley trailed by seven with less than two minutes remaining in the first half before Maniscalco proceeded to hit two consecutive three-pointers and junior guard Andrew Warren added a two-pointer to give the Braves a 32-31 halftime lead. Warren was the only other Braves’ player to score in double figures with 14 points. Senior guard Chris Roberts added nine points and nine rebounds as well as a thunderous one-handed putback dunk that brought the Bradley’s fans to their feet. 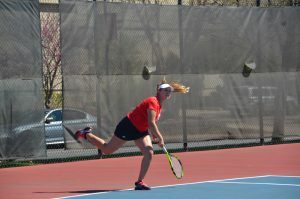 The second half was dominated by the Braves who outscored Creighton 49-31 over the game’s final 20 minutes. A 14-2 second half run sparked by eight Maniscalco free throws put the game out of reach. The Braves were a remarkable 27 for 28 from the charity stripe. Bradley head coach Jim Les said the team’s game plan was to try to force the action and get easy points. Creighton head coach Dana Altman said Maniscalco really sparked the Braves and was key in the victory. “Sam just beat us up today. We didn’t do a good a job on him. He’s a really good player,” Altman said. Altman’s praise for Maniscalco didn’t stop there. “He is tough and smart. I like everything about his game,” Altman said. 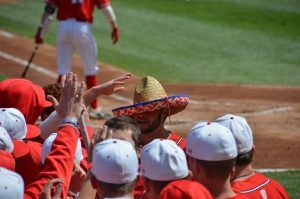 The Braves will face top seeded Northern Iowa in Saturday afternoon’s semi-finals.